So to make things a little bit easier for all, here is a list of some of the “Basic Operational Amplifier Building Blocks” we can use to create different electronic circuits and filters. The Voltage Follower, also called a buffer dose not amplify or invert the input signal but instead provides isolation between two circuits. The input impedance is very high while the output impedance is low avoiding any loading effects within the circuit. As the output is connected back directly to one of the inputs, the overall gain of the buffer is +1 and Vout = Vin. The Inverter, also called an inverting buffer is the opposite to that of the previous voltage follower. The inverter does not amplify if both resistances are equal but does invert the input signal. The input impedance is equal to R and the gain is -1 giving Vout = -Vin. The Non-inverting Amplifier does not invert the input signal or produce an inverting signal but instead amplifies it by the ratio of: (RA + RB)/RB or commonly 1+(RA/RB). The input signal is connected to the non-inverting (+) input. 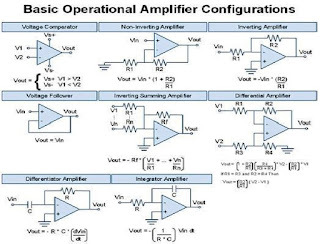 The Inverting Amplifier both inverts and amplifies the input signal by the ratio of -RA/RB. The gain of the amplifier is controlled by negative feedback using the feedback resistor RA and the input signal is fed to the inverting (–) input. The inverting and non-inverting amplifier circuits from above can be connected together to form a bridge amplifier configuration. The input signal is common to both op-amps with the output voltage signal taken across the load resistor, RL. If the magnitudes of the two gains, A1 and A2 are equal to each other then the output signal will be doubled as it is effectively the combination of the two individual amplifier gains. The Subtractor also called a differential amplifier, uses both the inverting and non-inverting inputs to produce an output signal which is the difference between the two input voltages V1 and V2 allowing one signal to be subtracted from another. More inputs can be added to be subtracted if required. If resistances are equal (R = R3 and RA = R4) then the output voltage is as given and the voltage gain is +1. If the input resistance are unequal the circuit becomes a differential amplifier producing a negative output when V1 is higher than V2 and a positive output when V1 is lower than V2. 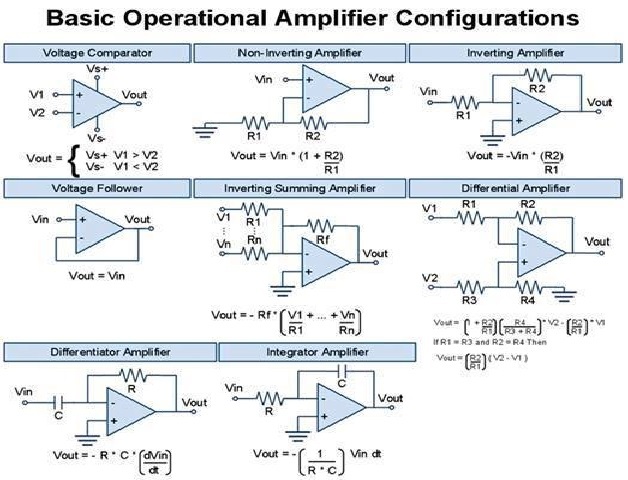 The Comparator has many uses but the most common is to compare the input voltage to a reference voltage and switch the output if the input voltage is above the reference voltage. If the input goes more positive than the reference voltage set by the voltage divider, Vin > Vref, the output changes state. When the input voltage drops below the preset reference voltage and Vin < Vref, the output switches back. By using positive feedback the basic comparator circuit can easily be converted into a Schmitt Trigger to reduce oscillations around the switching point. Here are just some of the more common and basic operational amplifier building block configurations discussed in this section that we can use in electronic circuits. All the above circuits can be constructed using a variety of different op-amps including the famous 741 op-amp. I hope that this short tutorial about basic op-amp building blocks will help you to understand the different basic op-amp circuit configurations.